While perusing the Forever 21 blog this morning, I was reminded that I'm on the hunt for a nice white-button up. 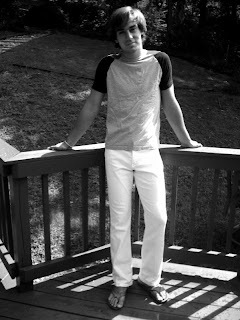 There's something crisp, clean and fresh about white button-up tops... and I want one (okay, maybe two or three). I just want the shirt, but entire outfit seen here. Top only here ($15.80 at F21). So where would you shop for the perfect white button-up shirt? Summers and falls in Atlanta are great T-shirt weather. Layer 'em, pair 'em with jeans, wear 'em over swimsuits or dress 'em up tucked into flowy skirts. 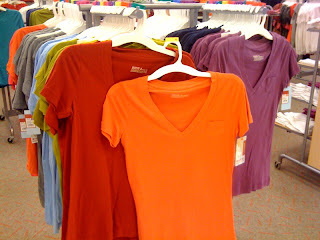 Right now I'm digging these deep V-neck tops from Target, available in most colors of the rainbow for $8. I love the layerability (new word? ), the touchably-soft cotton and the tiny pockets. 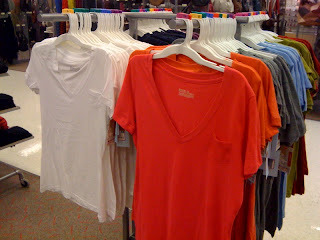 In my closet: heather grey and coral. Next up: lime and baby blue. Since I hadn't seen one of my besties in TOO long, Moeko and I decided we should meet for lunch. 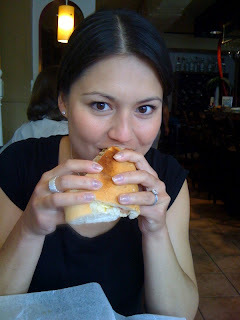 We each threw out a few suggestions (Spoon, Noodle, Thumbs Up Diner) before Moeko remembered she'd been wanting to check out a little Cuban joint called Papi's. She had me at "Cuban." Visions of plantains and flans danced in my head. I picked Mo up at her office and we headed toward the restaurant's Ponce and Myrtle Street location in Midtown. We found sweet street parking on Ponce and entered the colorfully-painted cafe. We weren't sure if we were ordering at the counter or waiting for a host to seat us. We were quickly redirected to a quaint downstairs seating area, full of other hungry lunch-breaking workers. The menu is simple but not lean. Daily specials like like chicken fricassee compete against classics (classic cuban sandwich, jerk chicken, etc.). We're two girls that like to eat. We opted to split an appetizer but asked the waitress for her recommendation: maduros versus tostones (both are plantains but one is ripe and the other is green). 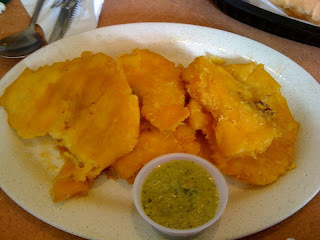 Without skipping a beat, she recommended the green plantains (tostones). Served with a spicy tomatillo-tasting sauce, the large (and lightly pan-fried) plantains were a great way to start the meal. Just the right amount of salt, sweetness and heat. Since Mo went with the authentic cuban as her entree, I decided to order the ropa vieja (shredded beef) sandwich. Moeko's was a perfect balance of smoked pork, ham, mayo and the regular condiments. 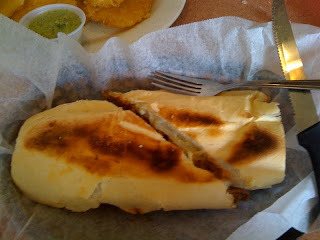 My sandwich elicited groans from me — tender chunks of slow-roasted beef with a tangy and spicy Cuban flavor. My ropa vieja. Now that's a lot of sandwich. Half a sandwich with a few bites of an appetizer would probably satisfy most lunch diners — but a full sandwich and a shared appetizer only set us back about $9/each with tax and tip included. We found our service to be fine and the food to be good. I'd go back in a heartbeat. I posted last week about serendipitously stumbling upon The Bead Shoppe in Avondale Estates. What a cool, unique and neat place — and a shop that should not be overlooked by Atlantans. The Bead Shoppe's Web site tells me that the shop is "Atlanta's one stop bead store for all your jewelry making and beading needs including: exotic beads, vintage beads, glass beads, Czech glass beads, crystal beads, Swarovski crystal, seed beads, Native American beads, African sandcast and bone, semi-precious stones, jade, sterling silver findings, copper findings, headpins, toggles, ear wire, beading wire, bead strands and much more." And "new classes and inventory are always being added." My eyes tell me The Bead Shoppe carries a helluva lot of items to build your own jewelry — as well as ready-to-wear pieces. I spotted beads-upon-beads in every shade and material under the sun, chains, vintage pendants and brooches, rings, clasps, beaded strands and more. Seriously, anyone with a hint of estrogen would have a field day in this place. I left the store last week with a simple chain used to make a tassel necklace and a chain made of various-shaped squares and circles — and I'm dying to go back and make something else. I should also add that The Bead Shoppe helped me get both of my necklaces in working order before leaving the shop (versus handing me a bag of my supplies and wishing me luck DIY-ing). I saw a sign on the door that said "private parties available." When asked to elaborate, the gal behind the counter guaranteed that the private parties are tons of fun — and when I inquired, she enthusiastically assured me that bottles of wine and snacks are more than welcome. I've been to pottery shops' studio space with wine in tow — but something tells me making a necklace or a bracelet may be a little more rewarding than an ugly platter. 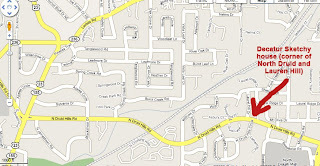 Decatur Metro has a great discussion going about where to find the best sandwich in metro Atlanta. See the post and discussion here. Where do you think we Atlantans can find the best sandwich in town? I'm a pretty big fan of the [pricey] sandwiches at Star Provisions — oh, and I think Taco Mac does a pretty good job with its sandwiches and wraps. Oh, and West Egg's fried green tomato BLT is pretty amazing. I usually reserve this blog for items and activities that I find fulfilling (finding great deals online and at thrift stores, eating, cooking, shopping my closet for wacky new outfits, etc.). Today I shift gears to something that's, well, not quite so fulfilling: HAVING A SUPER SKETCHY HOUSE NOT FAR FROM MY HOUSE!!! Drive-by of questionable abode... what's this place really about? I haven't been able to catch the actual street address on North Druid, but this home is on the corner of North Druid Hills and Laurel Hill Drive in Decatur. The red-painted wood and brick house is often accessorized with rando older men smoking cigarettes on the porch. I've not-so-affectionally referred to this house as the "nearby halfway house" but my husband's research tells me it's a "hotel" for Veterans. I wonder if the cracked-out-looking man/woman thing that was being escorted from the home yesterday BY POLICE was a veteran. He/she did not look impressed re: the formal removal, but he/she obviously talked the cop into letting him/her bring some Popeye's into the backseat. I'd like to hear more about just how legit this "Veteran's hotel" is. As of right now, it's not feeling quite so legit. Do you Decatur-ites know anything about said home? I'm dying to know. As I prepared for an appointment yesterday, I also did my healthy share of procrastinating. A girl has to think about what to wear, right? Ever since I saw Love Maegan's post about the DIY chain and tassel necklace, I'd been dying to make one of my own. So I took my eager little tail over to Hancock Fabrics to pick up some inexpensive chain and some upholstery tassels. The trip was half success and half bust. I bought two little black tassels — and asked an employee where I might be able to find some chain. I called Hobby Lobby. Still no luck. Then the sales lady recommended me to a place I hadn't heard of before — and I place that was mere stone's throw from my neighborhood Hancock's. It took me a few minutes to spot The Bead Shoppe (next to Salvation Army in Avondale Estates). What a cool place! 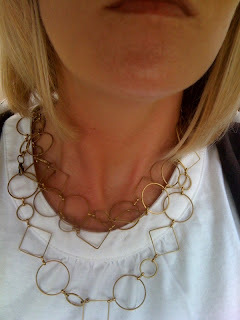 Not only did I find the same kind of silver-plated chain Maegan talked about in her blog (and about 20 varieties of it! ), I found some interesting brass chain made up of various-sized shapes. I knew it would be perfect for a necklace I could wear long (two layers) or shorter (three layers). 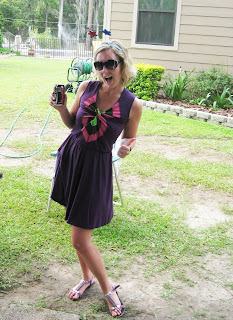 I mentioned in my June 27th post that I picked up a cute, boutique-y looking dress during our shopping excursion. When I tried on this dress at Goodwill (Lilburn), something just didn't feel right. I eventually realized it wasn't the length, but too much fabric in the skirt that made it fit funny. I took it over to Sunny's and asked if she could take out triangle-shaped pieces from the skirt at the hips (with the top of the triangle being the hemline). As expected, she said "no problem" and quoted me $10. The dress ended up making a comfy and casual swim suit cover up for the July Fourth festivities down in Orlando. The picture isn't great, but you can tell I now have a fine-fitting, unique summer dress with a decent price tag ($12 with tags-on from Goodwill plus $10 for alterations). By the way, forgive this sweaty photo. 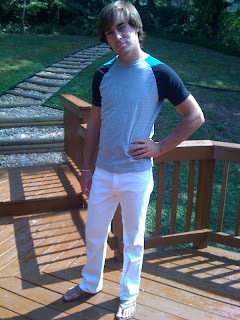 How Can You Pass Up a Pair of White Jeans? Because Paul + Katy + free time = Thrifting, we had to make a stop by one of the local Goodwills. We did have to fight off a bunch of blue haired ladies (apparently it's senior day on Tuesdays), but it was worth it. The Goodwill on LaVista in Tucker continues to be one of our favorite G'Wills. I can totally see these being preppy chic with a pink polo and boat shoes, or glammed up with some grimy high top sneakers and a concert tee. Awesome find. 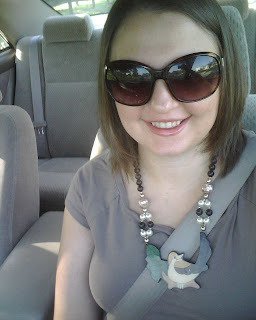 This morning, Julia boldly decided that today was the day... to wear the bird necklace, that is. "So everyone's response have been pretty positive. All the men have ignored the necklace because they know better than to ask (it would prove that they were looking at my ta-tas). The ladies all love it. Their initial reaction is pretty hysterical. You can see their mouths twitch and eyebrows raise but all of them love it. Shabrina did not disappoint. Here's how that went down:"
Coworker Shabrina: "Hey J, do you know wh...um, that's a nice necklace." Julia: "Oh you like it?" S: "I mean I wouldn't wear it but you can pull it off"
S: "Did you lose a bet?" J: "Something like that. It is my friend Katy's"
S: "Is she a white girl?" Today, I was a lady that lunched. I met up with my ex-work husband, Gregory, at a little Mexican place in Norcross. (Read more about work spouses here. )It had been WAY too long since I'd seen Greg, and we had plenty to update one another on. Greg's still in a very happy relationship and just returned from a great birthday trip to Florida. I filled Greg in on our house progress, married life and my work updates. And, of course, it seemed like a great occasion to snap a self-timed photo... so silly. More time = blow dried/flat ironed hair! Can you tell its 90+ degrees in Atlanta? We had over a few friends for dinner last night — and the topic of personal style came up. Maria mentioned that she is usually less apt to buy something when she has to buy a whole new outfit to support it (e.g. odd shoes). Then we talked about offbeat clothing and accessory choices. 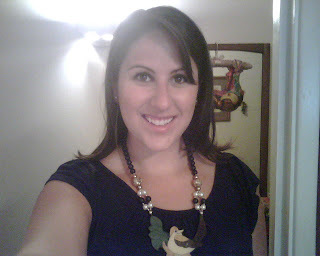 So naturally, my infamous bird necklace came up in conversation. The girls were appalled and amazed that I'd worn the necklace to everything from work to Moeko's rehearsal dinner. Seeing in that the diners had not seen the piece in person, I ran back to my room and returned with the beautiful avian creation. Megan and Julia immediately had an idea. They wanted to each wear the necklace to work — starting with Megan, then Julia next week. Maria, for some strange reason, did not volunteer to join in the fun. Dan interjected that he tried his best to not let me get the necklace... Anyway, we all brainstormed the kind of comments coworkers may have, or the kinds of looks they may send the necklace model's way. Here's Megan, sporting the necklace for her commute. Coworker/Friend David: (after lunch, walking back to their offices and passing another coworker in the hall) "Megan, who is that guy? I know he works with you... but what is his name?" Megan: "Yes, the bird. 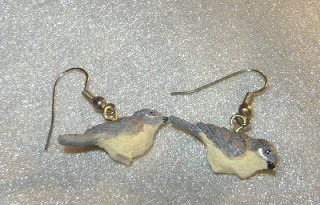 Speaking of bird's, what do you think of my necklace?" David: "Yeah, my initial thought was, 'when did Megan become an art teacher?'" And from Megan at the end of the day: "Though the day has not ended, this necklace has really grown on me!" Megan also reported funny looks/stares throughout the day, but not the same over-the-top comments we were expecting. Julia is sure her coworkers will be more vocal... stay tuned.